In 2007, Brock and his family were on their way to church on Christmas eve when a 92-year-old man ran a stop sign and hit the car in which he and his family were traveling. Brock’s father, David Mealer, and his brother’s girlfriend, Hollis Richer, were killed in the accident. 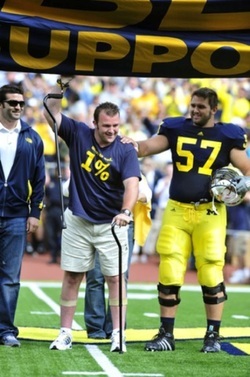 Brock sustained an injury to his spinal cord, which caused him to be paralyzed from the waist down. His surgeon gave him a 1% chance of moving his legs again, and an even lower chance of walking. Brock not only became independent again, but was blessed with an incredible comeback story that has led him to walk again with the help of two canes. After 2 years of grueling physical therapy, he started working out with the U of M football team strength staff. Once able to stand, Brock’s newly found team set the goal of leading the team onto the field for their 2010 opener; less than a year away. He went on to lead the team out on September 4, 2010, with the use of two canes. He also went on to walk with his bride, Haley, without canes, on his wedding day, December 22nd, 2012. They currently live together in Wauseon, Ohio, as Brock continues to train at every opportunity.